Good morning everyone. Today I am featuring an inspirational video from Close to My Heart. 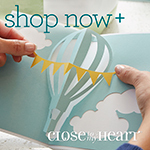 This video shows you how to use some of the great products offered by Close to My Heart. Also, don’t forget to check out the October stamp of the month – Very Merry Christmas. Get this 11 piece stamp set for just $5 when you place an order of $50 or more.